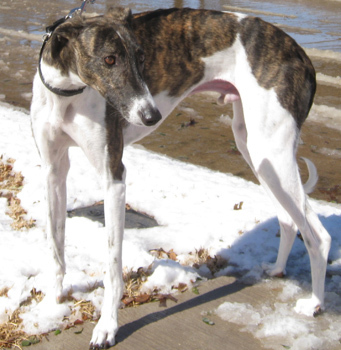 Jesse is a handsome brindle and white male estimated to be 3-4 year old. He was picked up by Amarillo Animal Control on October 28, 2010 as a stray. Jesse arrived weighing only 33½ pounds. Because the shelter didn't think he would make it through the weekend without help due to his emaciated condition; GALT was allowed to take him to Dr. Wick Culp at Animal Medical Center for the weekend for medical evaluation and treatment. This was in spite of the mandatory 72 hour hold time. 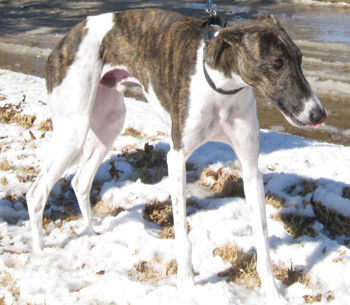 Jesse was successfully treated for Ehrlichia Canis and internal parasites. He now weighs 54 pounds and is ready to find his forever home! Jesse is cat trainable, and has not yet been tested with small animals.